It brings back so many memories. Nani = Grandmother. Mum’s mum. I grew up for 5 short years in Nairobi, Kenya. I lived in a big household with my mother, uncles, aunts, cousins, and nani and nana. It was a busy place, and my grandmother was the head cook of the household, she wore the highest hat! My mum too was a really good cook who also ran her own catering business and I’m sure my auntie’s and uncles had their specialties…but my nani’s dishes I have always remembered. The taste still lingers on my palette as I dream of her meals…mmm. I guess that’s when it started, helping her and mum in the kitchen at such a young age. My nani was always the most organized person in the kitchen. She woke up early every day, had her sweet buttered toast (toasted, then buttered, then toasted again) and a nice cup of tea. She would then start her chopping and cooking and would pretty much be done cooking dinner by the time the family woke up. Everyone would go their separate ways for the day and return for dinner to enjoy her delicious home cooked meals. I learned a lot from my nani, she taught me about flavours in the kitchen, textures and spices. I eat food the way she did because that’s how I grew up eating it. I’ve picked up some of her favourite foods as well such as the love for sweet buttered toast, putting sugar in my Punjabi Kadhi, very crunchy foods, pasta, bread and a simple delicious soup! I remember sitting down at our dinner table, with my nana at the head, all of us in our designated seats, and seeing this soup on the table. It was one of those meals the whole family was excited for; everyone had a smile on their face. Thankfully my nani was the most generous person. She was always willing to share her secrets in the kitchen and took such pride and joy to see others enjoying her recipes. What makes this soup so delicious is the simplicity. My nani always believed in using the freshest ingredients and not over complicating dishes. You’ll see how she turned such few ingredients into the little black dress, the tuxedo of soups. Every lady needs a LBD in her closet and every man needs a tux. To compliment your LBD or tux, statement jewelry….aka. Nani’s BEST croutons. 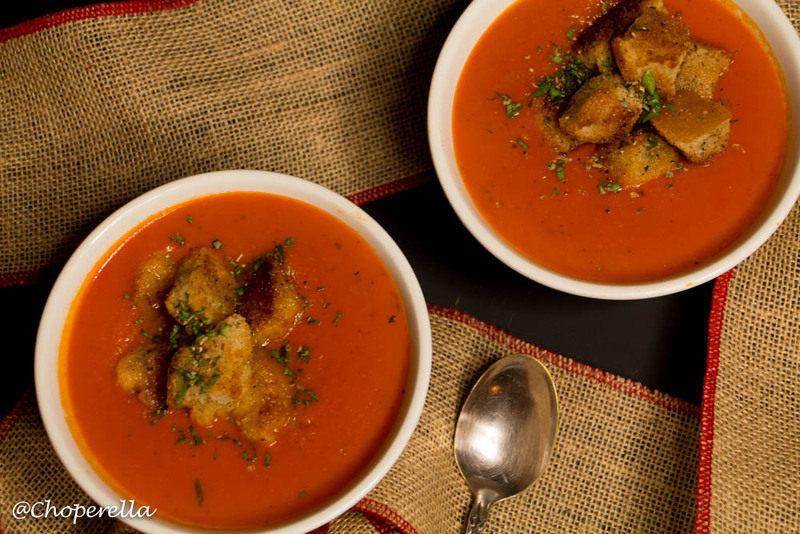 These croutons were maybe my most favourite part growing up; crispy, buttery pieces of bread dunked in my favourite soup. This soup is creamy with out the cream. It’s got a lovely aroma of sweet tomatoes and oregano at the end of cooking. 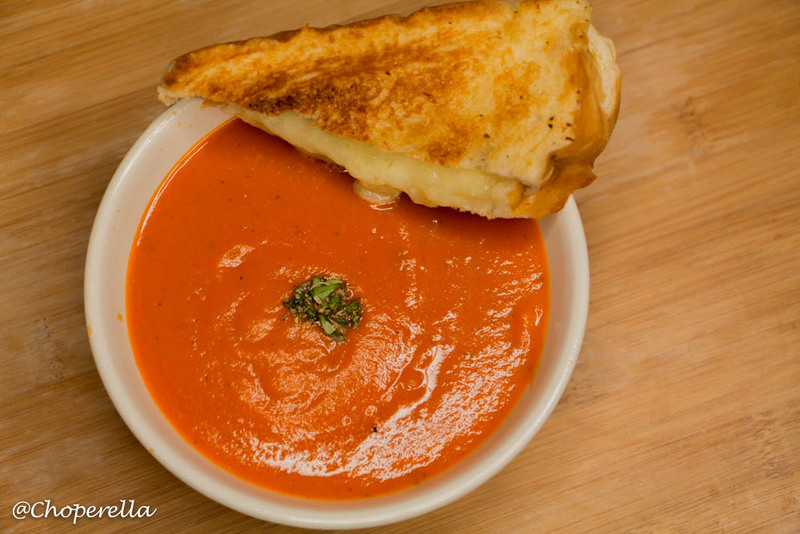 It’s got a texture similar to a tomato sauce but the flavours are subtly savoury and sweet. It has creaminess from the potato in the soup, which also helps to thicken it. 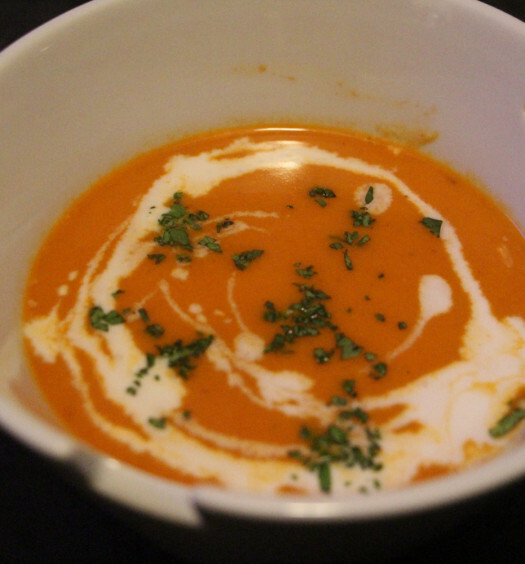 The carrot played in some additional sweetness and colour to the soup as well. The only spices used were salt, pepper and dried oregano, this really helped the tomato’s shine and bring out their natural flavour. Although the tomato’s I used are canned, traditionally my nani used tomato’s from Kenya, which are much sweeter than those grown here (it’s also winter and not tomato season, so canned are a better option!). I opted for canned San Marzano tomato’s for their sweetness. 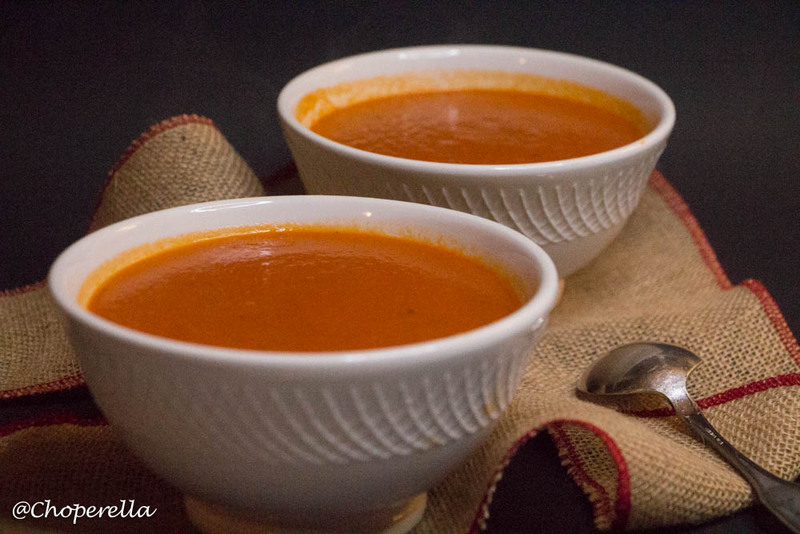 Cooking the tomato soup for a longer length of time helps to cook out the tin flavour from the can and brings out the tomatoes natural flavours. 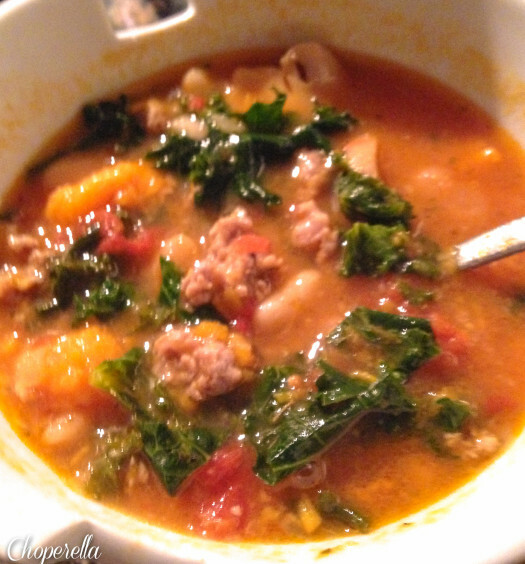 I learned a lot about the simplicity of soups and how so few ingredients can be flavourful. I look forward to using this recipe often and as a base for my future soup creations. My roommate tasted the soup and thoroughly enjoyed it and practically devoured the croutons!! **NOTE: my nani used a pressure cooker when she made this soup and purreed it after 2 whistles! I don’t own a pressure cooker so I cooked it for an additional 20 minutes. Nani would be so happy to see so many people enjoying her soup as much as her family always has, enjoy! Soup: 1. Crush the tomatoes in a separate bowl. Keep the juice of one can. 2. On medium high, melt the butter and sweat the chopped onions. Add the ginger, garlic, potato and carrot. Cook for 2 minutes. 3. Add the tomatoes and juice. Cook for another 2-3 minutes. 4. Season with a little salt and pepper. Remember the mixture will reduce, so you can always add more if need be! 5. Add boiling water and stir. Bring to a boil, then reduce the heat and simmer for 40 minutes on medium-low heat. 6. Blend or Puree the soup. Add the oregano and sugar. Add more if it’s a bit tart. 7. 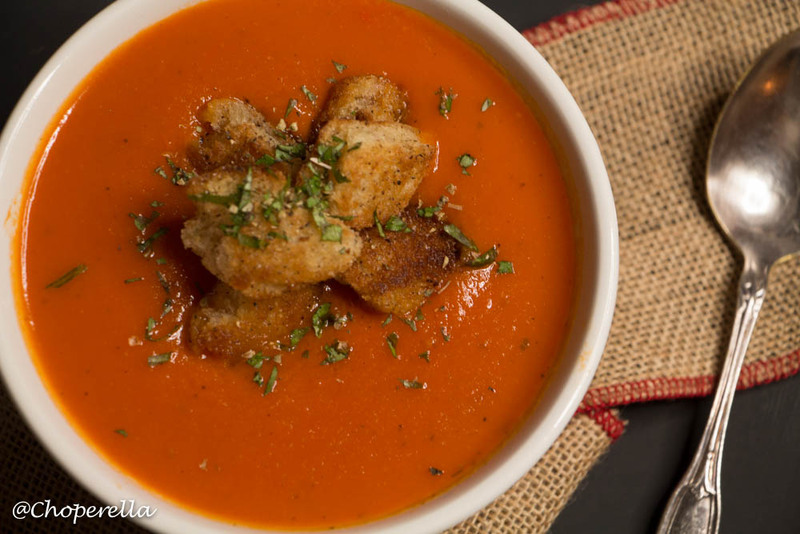 Serve with the best croutons or a classic grilled cheese. Croutons: 1. Heat up equal amounts of butter and oil for a shallow pan fry (I put more butter than oil…because, fat is flavour!) 2. When butter and oil are bubbling, add the cubed bread and toss to coat. Cook on all sides until evenly brown. 3. When done, toss with salt and pepper and place on a paper towel to rest until serving. 4. Remember they’re for the soup as garnish…don’t eat them all! Looks fabulous! you had me hooked at sweet toast. What makes it sweet? Does the butter caramelize with the second toasting? Thank you Bernice! Oh sweet toast…I wake up and crave it every morning :$ You’re right, the butter basically caramelizes. It’s so delicious on it’s own or even with some jam on it! This soup sounds so warm and comforting. San Marzano tomatoes are my favourite! I actually found them at Walmart, the last place I would have thought. Great brand (I apologize but I forgot the name) and very well priced. They’re available at many grocery stores though. Thanks for stopping by! Shareba! I just remembered this comment about san marzano’s. My mum found a case of them at Costco! They’re awesome! That’s so cool that you lived in Kenya with your extended family. I loved hearing the background to where this recipe got its beginnings. Do you speak Swahili? Funnily, my father lived in Kenya for about a year, but that was well before we were even born. Thank you Jess! I used to speak it fairly fluently living there, but since i’ve been here for over 20 yrs it’s gone. I went back in January and they taught me a little bit just enough to get by! Has he been back? There is nothing better than eating a beloved recipe. Thanks for sharing your memories!